Another thought-provoking analysis by Gareth Smyth, former Iran correspondent for the Financial Times. Developing further his exploration of the power struggles within Iran's political elite and their implications (posted here on Wednesday), Smyth argues that intra-elite "differences over foreign policy are central to the crisis in Tehran" ... and that therefore the defeat of Rafsani and his allies would be geopolitical bad news. Washington has long understood that to talk with Iran, it must deal with Ayatollah Khamenei. But while Ayatollah Khamenei is pre-eminent in the leadership group, the events of the last week do not suggest he is about to curb the growing influence of Mr Ahmadinejad. Mr Rafsanjani has prided himself on his realism since he emerged in the revolutionary movement against the Shah. He played a key role in talks with the US leading to the release of western hostages in Lebanon two decades ago, and he portrayed himself in his unsuccessful presidential bid in 2005 as the person best placed to deliver an agreement with Washington. For Mr Ahmadinejad, in contrast, principles are preferable to compromise. One of his early acts in office was a cull of ambassadors and officials linked to Mr Rafsanjani, especially those who conducted the 2003-5 talks with the European Union over the nuclear program. Hossein Musavian, the former negotiator with the EU, even faced spying charges. During the recent election, Mr Ahmadinejad explicitly criticized the talks with the EU, despite the fact they were endorsed by Ayatollah Ali Khamenei, the supreme leader. Are talks with the US so different? Is it overstating matters to suggest that these foreign-policy differences are so dramatically sharp, let alone that they are "central" to the current political crisis? I'm not sure. But if Smyth's interpretation is correct, the implications are very important. And at all events, most of Smyth's analysis of the Khamenei/Rafsanjani power struggle in this piece is definitely on-target and illuminating. => Let's be clear: Rafsanjani is no good guy, nor has he ever been a "moderate" or "reformist" except in some very relative sense. Instead, he is one of the central figures--perhaps the iconic figure--of the clerico-kleptocratic 'establishment' faction of Iran's authoritarian elite. It was also Rafsanjani, not Ahmadinejad, who once mused publicly that a nuclear war with Israel would be OK, because it would merely harm the Islamic world but would destroy Israel. If one day, the Islamic world is also equipped with weapons like those that Israel possesses now, then the imperialists' strategy will reach a standstill because the use of even one nuclear bomb inside Israel will destroy everything. However, it will only harm the Islamic world. It is not irrational to contemplate such an eventuality. During the reformist experiment of 1997-2005, when Khatami was President, Rafsanjani epitomized what the reformers saw themselves as fighting against. In recent years, however, Khatami and Rafsanjani have made common cause, and in this election Rafsanjani threw his support behind Moussavi's anti-Ahmadinejad candidacy. What happened? The big change is that since 2005 a whole range of factions within the political elite have become increasingly alarmed at the threat of a total take-over by the Khamenei/IRGC/Ahmadinejad bloc--alarmed enough that they have not only come together in a stop-Ahmadinejad coalition but have also been willing to reach out to reformist constituencies. (For some details, see my previous posts here & here & here.) So what is going on now represents, among other things, a very high-stakes struggle over the future nature and direction of the Iranian regime itself. => For self-styled foreign-policy "realists," such questions about the shape of Iranian society & politics matter less than questions about how Iranian political developments might affect Iran's relations with other countries. With respect to such issues as Iran's nuclear program, the extensive role of the IRGC and the intelligence services in international terrorism, or the Iranian regime's support for groups like Lebanese Hizbullah and Hamas, would it make a significant difference whether the Khamenei/IRGC/Ahmadinejad axis or the Rafsanjani/Moussavi/Khatami axis emerges triumphant from the present crisis? There are a range of possible answers to this question, and I'm not sure which is closest to being correct. There have been plausible arguments that the basic answer is no. That is, with respect to those issues--the kinds of nuclear and foreign-policy issues that most concern the US government and other foreign governments--an Iranian government without Ahmadinejad would continue to pursue essentially the same policies as before. They would simply pursue them in a less noisy and confrontational way, which might even prove more effective in deflecting international pressure. Smyth, however, suggests that the basic answer is yes (even if we leave aside the political implications of this week's popular upheaval in Iran). That is, there is a genuine split within the elite on foreign-policy issues, and an Iranian government dominated by the Rafsanjani/Moussavi tendency would be more open to negotiating a constructive compromise on the nuclear program and other such issues. If so, then a victory by the Khamenei/IRGC/Ahmadinejad axis would make a desirable negotiated solution less achievable. Unlike Rafsanjani & Co., who might be willing to make a genuine deal, they're not really interested. Unfortunately, I suspect that the most likely short-term outcome of the present crisis will leave the Khamenei/IRGC/Ahmadinejad axis in control of Iran. (I would be happy to be proved wrong, but I'm not optimistic.) If Smyth is right, that means bad news not only for Iranians--we knew that already--but also for everyone worried about the risks of nuclear proliferation (which I think should include all sane people). So perhaps we should all be rooting for that old scoundrel Rafsanjani (even if it's hard to work up warm and affectionate feelings for him)? At the very least, Smyth's analysis is worth considering carefully. TEHRAN BUREAU | The clearest sign of the bitter division within Iran’s political class — at least before the post-election crackdown — was Mahmoud Ahmadinejad’s attack on Akbar Hashemi Rafsanjani during a televised election debate. 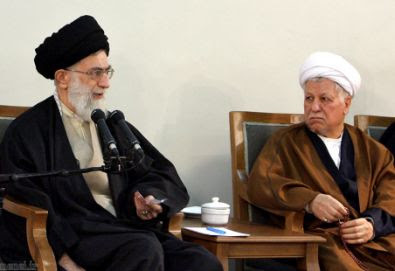 Mr Rafsanjani was prompted to write a more-or-less open letter to Ayatollah Ali Khamenei, the supreme leader, after Mr Ahmadinejad accused him of corruption and called him the “puppet master” behind his main challenger, Mir-Hossein Musavi. Mr Ahmadinejad’s criticism of Mr Rafsanjani go back to the start of his 2005 presidential campaign, when he was the mayor of Tehran and barely known across the country. These attacks have centered not just on Mr Rafsanjani’s alleged opulence but on his foreign policy outlook, and this suggests that current events in Iran will affect the prospects for president Barack Obama’s policy of engagement. Although Ayatollah Khamenei in March backed talking to Washington at least in principle, an influential group of fundamentalists — whose views are clearly expressed by Hossein Shariatmadari, editor of Kayhan — oppose any dalliance with the Great Satan. This group is deeply concerned over US intervention in Iran, either through support for armed groups among ethnic minorities or attempts to foster a “velvet revolution” modeled on Ukraine. Hence, while Iran’s political class shares a commitment to the country’s nuclear program and its “right” to be treated as an international power, there is clear evidence of differences over engagement with the US. Officials from reformist and pragmatic conservative camps have for years floated a possible compromise on the nuclear program that would see Iran limit its activities and return to full UN inspection under the Additional Protocol of the Nuclear Non-Proliferation treaty. The Iranian team during the 2003-5 negotiations with the EU believed a sustainable agreement was possible. I was told by an Iranian involved in the process that Hassan Rowhani, who led the Iranian side, in 2004 asked the leadership to back an agreement for capping uranium enrichment, a proposal he seems to have believed Europe would come to accept. But most European diplomats at the time believed Mr Rowhani was merely playing the good cop when he warned them that failure to agree would lead to a shift to the right in Tehran. The rightward shift came with Ahmadinejad’s 2005 election win and is now accelerating. The president is well aware that the coalition opposing him — including not just Mr Rafsanjani and Mr M0usavi, but former president Mohammed Khatami and former speaker Mehdi Karrubi — came together largely in fear that Mr Ahmadinejad was damaging Iran’s international position. Both sides in the fractured political class understand their differences are intrinsically linked to foreign policy. Even if Mr Obama can find a clear route to Ayatollah Khamenei, he can hardly relish dealing with an Iranian leader facing an internal crisis and a possible power struggle. Mr Rafsanjani, meanwhile, can be expected to resist both his own political demise and what he sees as the undermining of the Islamic system by Mr Ahmadinejad’s recklessness. Unlike many of his reformist allies, Mr Rafsanjani holds two important state positions as the head of both the Expediency Council and the Experts Assembly, which has a constitutional responsibility to supervise the supreme leader. Various reports and rumors are swirling that Mr Rafsanjani is in Qom trying to co-ordinate clerical opposition to Ahmadinejad, or even that he plans to call an extraordinary meeting of the Experts Assembly. A reformist journalist once compared the relationship between Ayatollah Khamenei and Mr Rafsanjani to a married couple who quarreled but could not live apart. I start to wonder if either party might now be thinking of divorce.